This post covers 4 free YouTube tags generator tools. Here these websites take a phrase or keywords from you and then generate corresponding tags. You can add tags in the video description or inside the tags option. These websites how you list of closely related keywords and phrases. You can copy or download the list of all the tags that this tool generates and use them wherever you want. If you are a YouTuber then you should’ve known this fact that tags important role for the YT videos. With tags, you describe what your video is all about. In general scenarios, you have to write them manually, But with the following websites, you will not have to do manually. You just specify the video title or just the principal keywords to get the relevant tags that you can update in the description of your videos. 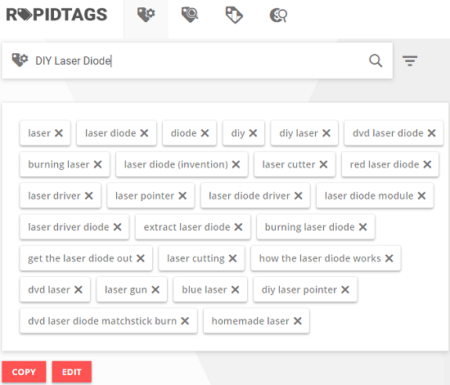 Rapidtags is one of the best free YouTube tags generator websites. Here this website takes video title or the keywords and generates the related tags. It uses data from YouTube and shows that to you. The tags that it shows can easily be copied to the clipboard so that you can download them. And to use this website, you don’t have to create an account. 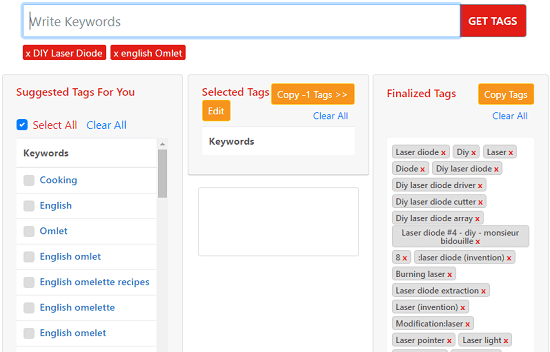 You just access this tool, specify the keywords and then get the related tags. After getting tags, you are free to do anything you like by adding them in your video. Just go to the homepage of this tool using given link. Since no sign up is required so just specify the main text, keywords or the video title. Next, hit the Enter key and then it will start processing your tags. After taking a few seconds, it will show you all the tags which you can copy or edit them if you want to. If you want to remove some tags from the results then simply click on the “x” option. In the end, simply copy all tags and then use them in your YouTube videos. TagsYouTube is a simple website which lets you generate tags for your YouTube videos. Simply input keywords or different phrases there to get the different tags for your video. Here it generates a long list of tags and you can selectively choose them to be added in your list. Before actually using them in your videos, you will have to remove some of them which are not relevant to your video. Also, if you want all the tags then you can do that. After adding the selected tags in the finalize list, you can simply copy them on the clipboard. It has a very simple interface where you just enter input keywords and get the output. Just like the website above, here you don’t have to create a free account. After that, you just enter the keywords in the box and hit the “Get Tags” button. It will then show you the all the tags in the list. After that, you just have to select the tags from the list and then add them in the final list. Or, if you want to add all the tags in the final list then you can do that. In the end, when the list of tags is ready, you just copy the tags and then use the in your YouTube videos and publish them. Tag Generator For YouTube is another free website which you can use to generate tags for YouTube. It works like the websites I have already mentioned above. You just give it the principal keywords or the video title and then it will get the you the list of tags. Just copy those tags and the use them in your videos. It generates the comma separated list of tags which you can edit as well. In addition to all this, you can use this website as a YouTube tags extractor as well. Just give it a URL of any YouTube video and then it will get you the list of used tags in that video. Using this website to generate and extract tags from existing YT videos is very simple. Using the given link, you can reach the homepage of this tool and then enter the video title or keywords. Next, click on the “Find tags” button and then it will show you the relevant tags after analyzing input. It places then generated tags with command and you can edit them as well if you want to. In the similar way, you can use this tool to extract tags from existing videos too. In place of keyword, just add the video URL and it will take care of the rest. 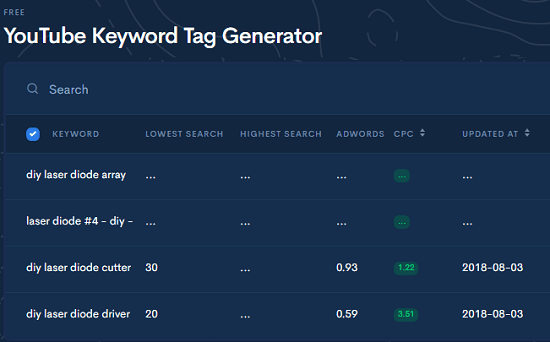 YouTube Keyword Tag Generator is the last free tool in my list which you can use to generate tags for a video., here it take a few keywords from you an input and return list of relevant tags that you can use in your videos. And not just tags, but it shows some other information about those as well. In the result that it produces, you can see search volume, AdWords competition like details as well. While using this tool for free, you will only be able to get limited number of tags. But if you want to get more tags than you will have to subscribe to one of its paid plan. The above given link will take to the homepage of this website. After that, you just have to input keywords that you have sued in your video title and description. Processed with the input and then it will take a few seconds to show you the output. It produces the result in tabular manner. You can see the list of tags it has generated for you and along with some other information like date updated, search volume, competition, etc. These are the best online YouTube tags generator websites which are available to use for free. All the websites that I have listed above work perfectly when you want to use them to generate video tags. All you have to do is just specify some keyword related to your video and they will generate a list of tags that you can use. Out of all the websites I have listed here, Rapidtags and Tag Generator For YouTube are the very good options. So, if you are looking for some free YouTube tags generators then this article will be useful. Also, you can use other simple ones if you think they’ll do the job for you.